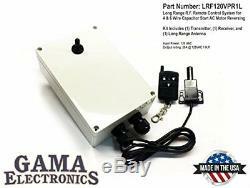 RF Remote Control System, 120VAC Single Phase, Capacitor Start (4-wire) AC Motor Reversing The LRF120VPR1L is a 340 MHz RF receiver designed for use with boat lift, winch and rail systems. 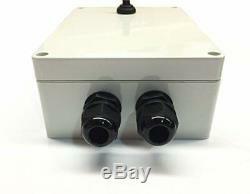 The receiver operates from 120VAC and provides a polarity reversing output for use with four/six lead AC motors. The receiver is equipped with a manual toggle switch and an additional latching output is available for connecting to a 120VAC light. The receiver is encased in a waterproof enclosure. The operating range is approximately 500 feet. Operating temperature range - 0° F to 160° F. Polarity reversing output: The transmitter has two buttons assigned to the motor output. The up (^) button runs the motor in one direction and down (v) button runs the motor in the opposite direction. The reversing function is accomplished by reversing the phase on two of the 4 motor connections at the receiver output. 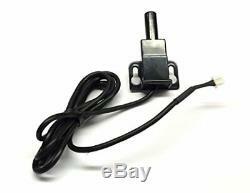 Manual switch: The receiver is equipped with a manual switch that can be used in place of the transmitter. Light Output: A 3rd button on the transmitter is included for the light output. Specifications Radio Frequency 340 MHz NEMA 4 enclosure The relay contacts are rated at 20 Amps/ 1HP External antenna Power for the receiver can be in the range of 100 to 132VAC Receiver dimensions are approximately 5.75 L x 4 W x 2.5 H. Refer to the table for motor connections. 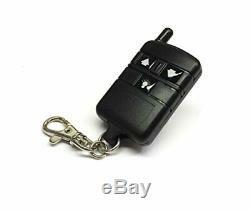 Boat Lift RF Remote Control System, 120VAC Single Phase, Capacitor Start 4-wire. The item "Boat Lift RF Remote Control System, 120VAC Single Phase, Capacitor Start 4-wire" is in sale since Thursday, September 6, 2018. 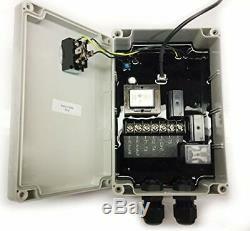 This item is in the category "Business & Industrial\Electrical Equipment & Supplies\Switches\Other Electrical Switches".